For over two decades, we have hosted a gratitude and recognition meal for the City’s contracted recycling and refuse collection workers in the spring. These individuals and their demanding jobs are often underappreciated. Granted, their efforts help keep the city clean and support our community’s curbside recycling and yard waste composting programs. We thank them for their service to Omaha. 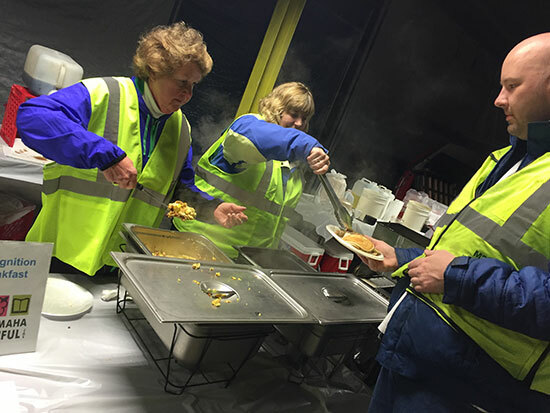 Keep Omaha Beautiful Board Members, Marla Fries and Tally Mertes, express their gratitude to a recycling/refuse worker as they serve up eggs and pancakes at the annual Recognition Breakfast.